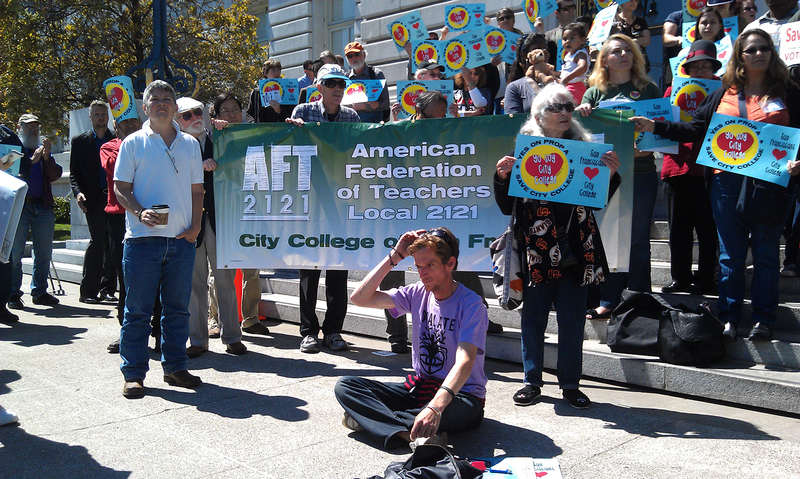 San Franciscans in front of City Hall rally in support of Proposition A. Photo by Erica Hellerstein. As San Franciscans dreamily trickled back to work on Sept. 4, throngs of students, teachers and city residents took to the steps of City Hall, rallying in support of Proposition A, a parcel tax on the November ballot that would bolster the fiscally distressed City College of San Francisco. If approved in November, Proposition A will levy an annual parcel tax of $79 to support City College. Voices in the crowd expressed concern about funding for the school, which serves more than 90,000 students and is currently bracing itself for another round of significant state budget cuts. The college’s Mission Campus, one of 11 in the city, has an extensive program in English as a second language that has been indispensable to many students who go there to gain proficiency in English and later find employment. “It’s extremely crucial that Proposition A passes and it’s crucial to continue to have these types of programs and community centers at San Francisco,” said Jorge Bell, dean of the Mission campus. Students at the rally expressed concern that if Proposition A does not pass, the college’s popular ESL and non-credit programs may be completely gutted. The ESL program occupies a special place of significance at the Mission Campus, which serves students from a variety of backgrounds. Sixty-eight percent of the over 8,000 students enrolled there identify as Hispanic/Latino, according to the campus website. In the 2011-12 academic year, 5,768 students at the Mission Campus took ESL classes. Others remain confident that even in the face of limited funding, the program will continue to serve its constituents. “Right now it looks like ESL programs will continue, but there is no guarantee that we are going to be able to be providing these classes and programs and at the same level that we have been providing so far,” said Bell. Does Prop A require a simple majority or a 2/3 supermajority to pass? Let it close! It will serve as a great example on how not to run a college. It will also lead to an FBI investigation into CCSF’s corruption.